Travel Rt. 64/Nittany Valley Drive approximately 6 miles. Enter the front of the building and you will be escorted to the B&B entrance. Travel Rt. 64/Nittany Valley Drive approximately 5 miles. Make left onto Park Avenue and follow straight onto Rt. 220 North. After exiting, make a left onto Rt. 64. Follow Rt. 64 – You will pass a Uni-Mart, Jersey Shore State Bank, and Michael's Tavern on the right. You will then pass the Mingoville Post Office on the right. After the post office, approximately a mile on the right, you will see a little yellow sign saying Hublersburg Road. 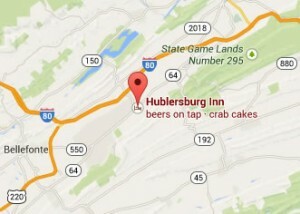 The Hublersburg Inn will be less than one mile down the road on the left hand side.